Discussion in 'KA-BAR Knives' started by COSMO, Apr 13, 2019 at 4:52 PM. 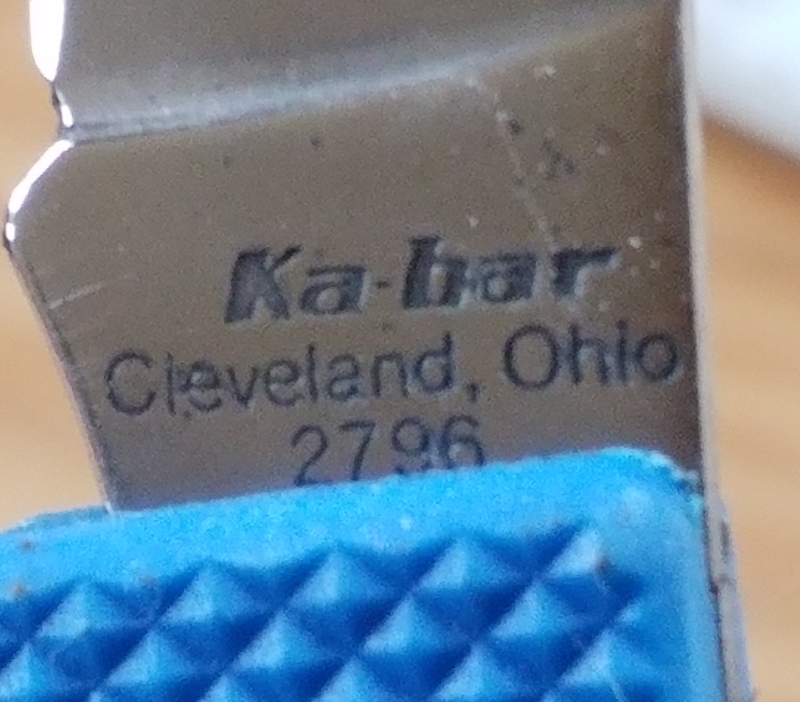 Looking for any info on this little k-bar. Picked it up at a gun show and have not been able to find anything about it online. It is new, with original box.Interested in when and where it was made, and it's value. The reverse side of the tang says "stainless Hong Kong." I'm guessing that maybe the blade came from Hong Kong and it was assembled in Cleveland. That box matches others I have from the 1980s. I appreciate the information, that's very helpful, thanks. These were completely made in Hong Kong, they were not assembled here in the USA. They are also "Hong Kong" quality, Cole had no interest in keeping the KA-BAR famous quality alive, they just wanted to make money selling knives. 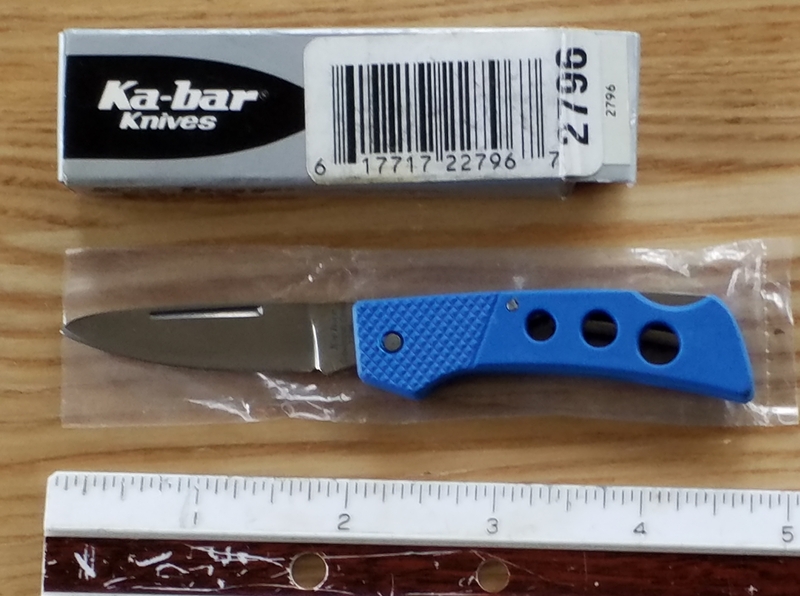 interesting, do you have any guess on what the value of this little knife is? Gee, Tank, why not?? I don't know the value, I don't know anybody who collects the Hong Kong Cole knives but there are collectors of everything known to man so there may be somebody who actually wants one of these. There is one on ebay now with a $5.90 opening bid and no takers yet. The ebay one had brown sclaes and no box. By the way Mike, the NCCA two day knife show is April 27-28 in Groton, CT. There will be 110 tables or 880 feet of knives for sale trade, or show and tell. Come on up, it's not too far and there will be plenty of knives. Stop by my table and say hello. There is also the Mystic Seaport museum nearby and plenty of boutique shops to keep any wife happy. You can go to their site for more info. Northeast Cutlery Collectors Association. Everybody here who is close enough ought to come to this, the biggest and best all knife show in the northeast. Hey Gene. Lol I should edit that post to read I dont like to give values. Thanks for the heads up about the knife show. That could be a nice leisurely ferry ride across the sound. I might just see you there.